Close your eyes and connect with the music that fills our church each week. Our Musicians provide inspiration and reflection year-round. Have a song in your heart? Our musical groups are always looking for new members. Singers and instrumentalists welcome. Can’t read music? Don’t worry, we’ll help you. And remember, your willingness is all you need. Participation is key; talent is secondary. 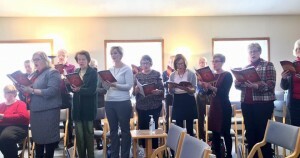 See our latest singing schedule! Enjoy “Praise to the Lord, Here I Am!” arranged by bell choir member Andrew Mertzenich in honor of his grandma. Presented July 2015.